As many industry analysts predicted, uranium stocks rallied strongly following the Liberal Democratic Party's (LDP) landslide victory in Japan's election over the weekend. Since the Fukushima disaster, Japan has become the bellwether for the sector. The LDP's pro-business and pro-nuclear platform means that its win over the incumbent Democratic Party of Japan (DPJ) --- whose members promised in September to phase out the nation's nuclear power program by 2040 --- will help rebuild positive sentiment in the flagging uranium market. 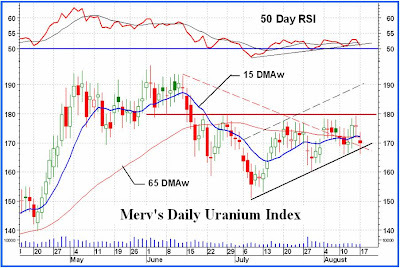 "We think this could be the turning point in the sector many have been waiting for and reiterate our affinity for select uranium names in 2013," said Chris Berry of Discovery Investing and House Mountain Partners in his latest edition of Morning Notes. The LDP garnered a two-thirds majority in Japan's lower house of parliament after campaigning on the "need to restart the reactors to cut the cost of importing natural gas and coal to fire conventional power stations," reported Bloomberg's Christopher Donville. News of the election's outcome led to significant jumps in some companies' share prices, including Uranium One (TSX:UUU), Energy Resources of Australia (ASX:ERA), Bannerman Resources (ASX:BMN,TSX:BAN), Paladin Energy (ASX:PDN,TSX:PDN) and Cameco (TSX:CCO,NYSE:CCJ). Pre-Fukushima, nuclear power accounted for nearly 30 percent of Japan's energy supply; now, however, only two of its 50 nuclear reactors are operational. Alternatives like natural gas, oil and coal resources are limited on the island nation, and the high cost of importing energy has placed a significant burden on the country, which is trying desperately to rebuild its economy. To alleviate the problem, the LDP believes Japan must restart the remaining idled reactors quickly and has proposed a three-year review to determine which are safe enough to come back online. "The cost of higher energy imports is increasing the cost of living; Japan's balance of payments is weakening; and the government's ability to stimulate economic activity is being hampered. Renewable energy and imports of oil/liquefied natural gas are too expensive for the economy to maintain," said Robert Gill, portfolio manager with Morrison Williams Investment Management, as reported by The Globe and Mail. However, investors should remain cautious, advises Berry in Morning Notes. "To be clear, if and when a re-start of the Japanese reactors commences, it may take longer than many anticipate as each nuclear plant must be inspected and cleared to resume operations. Reportedly, the Japanese Nuclear Regulation Authority is actively inspecting six plants to determine if they were built on active fault lines." To facilitate a faster restart process, industry insiders have said the LDP will need to push through changes to the current regulations set down by the DPJ, which require that any nuclear reactor restart have the approval of the prime minister, energy minister, two additional cabinet members and Japan's new nuclear regulation agency. Analysts expect a wave of nuclear restarts in Japan between 2013 and 2015. That will increase U3O8 demand at the same time as the market is forecast to experience a significant drop in available supply. Near the end of 2013, the US-Russian Highly Enriched Uranium (HEU) Agreement --- officially dubbed the Megatons to Megawatts Program --- will be coming to an end. The HEU agreement has accounted for nearly 15 percent of global uranium supply, and its termination in the new year heralds a looming uranium supply shortage that market watchers believe will be the catalyst for a return to the glory days for uranium stocks, especially if the industry keeps experiencing supply setbacks. The most recent report of production setbacks comes from Australia, where the federal Environment Minister has delayed an approval decision on Toro Energy's (ASX:TOE) Wiluna uranium project --- slated to become the state of Western Australia's first uranium mine. Couple the end of the HEU agreement, the new beginning for Japan's nuclear industry and the enormous growth in China's nuclear program --- 60 new reactors over the next decade --- with the avalanche of expansion and production deferrals this past year --- including Olympic Dam, Langer Heinrich, Cigar Lake --- and the uranium market just may be on the verge of a roaring comeback.